For those of us who are sensitive, you may wish to avoid this blog post however it is fascinating and sometimes heartbreaking to see and to hear the cruelty of the natural world. From severe droughts and fatal injuries to vicious predator hunts - the circle of life in the animal kingdom never ends and a perfect example of the courage needed to face this despair happened in Siwandu with our guests Jean Pierre & Andrea Ziegler watching on..
As they set out on an early morning game drive they immediately found a giraffe in the throws of giving birth. Giraffes give birth standing up, requiring the newborn to fall just under 2 meters to the ground! Designed for such an abrupt entry into the world, a newborn calf can usually stand up and run within an hour of being born. However our baby giraffe was not able to walk and seemed paralysed on one side. For this reason it didn't take long for the giraffe to attract the attention of a cackle of hyenas but the mother was not ready to give up her newborn that easily and for the next five hours Andrea and Jean Pierre watched the whole drama unfold. Sadly in the end the mother was left with no alternative but to kill her own calf, not wanting to leave her precious newborn to a death by scavengers, she kicked her baby to death. 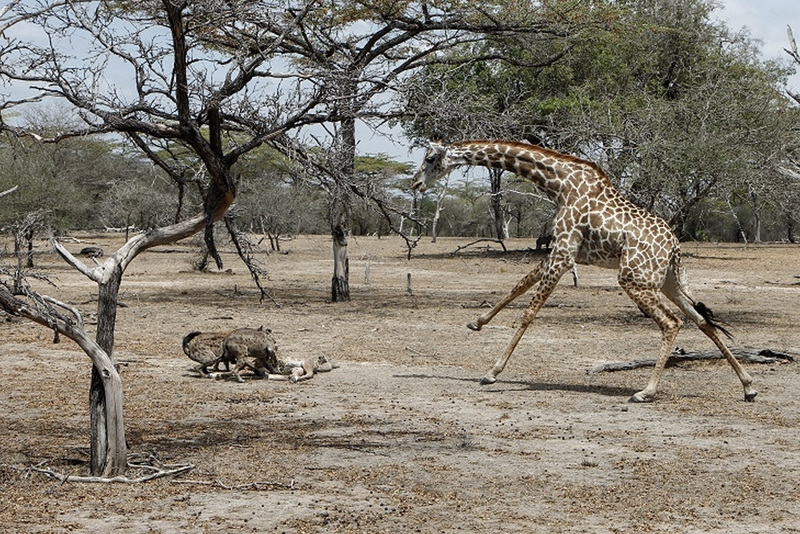 After the fatal act the mother began to walk away, leaving the hyenas their chance to pounce but the giraffe's instinct to protect her child fought on and she kept returning to chase off the hyenas - this momentous courage and fierce maternal instinct was captured by Andrea & Jean Pierre in this photo. However in the end the wait for the hyenas paid off, our battle-weary mother giraffe walked away and the hyenas got their meal. Nature forever astounds us - from the beauties to the cruelties - and living in Siwandu offers us the chance to experience the full spectrum of this crazy natural world. A huge thank you to Andrea & Jean Pierre for sharing this story and their photographs with us and you.